We have a strong team with five doctors who are graduates of Michigan State University, seven Licensed Veterinary Technicians, and wonderful support staff. Each of our doctors has special interests and between our team, we treat cats, dogs, horses, exotics, small ruminants, hobby farm animals, and wildlife. Our full-service hospital is equipped to provide ultrasound, digital x-ray, surgery, and process blood work in-house. We also offer grooming and boarding for dogs, cats, and exotics. Our doctors and technicians are “on call” for emergencies all year long, including holidays. Dr. Shaffer dreamed of a clinic where just as the Ark in the Bible provided a refuge from the storm for all the animals, so would the clinic provide a refuge for people and their pets. 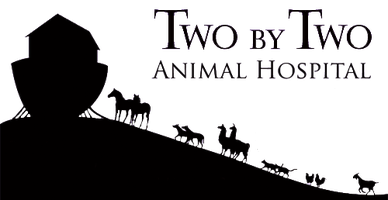 Two by Two Animal Hospital (formerly Hecht Veterinary Hospital) was originally founded by Dr. Phil Hecht as a full-service small animal and ambulatory equine hospital in 1967. Dr. Hecht sold the practice to Dr. Shaffer in December 2009. The hospital was renamed after the story of Noah's Ark and the animals coming to the ark to be saved, two by two. The hospital was remodeled and expanded in 2010 with the help of Busch Construction. We added a second building to house stalls for boarding/hospitalizing large animals, a grooming salon, and new space for boarding dogs. The main building got a total remodel, updated surgery suite, and isolation area. Visit our photo gallery to see the changes!